The Toronto Raptors hope the NBA is paying attention to Matthew Dellavedova. On the eve of Game 2 in their best-of-seven opening-round series with Milwaukee, Raptors coach Dwane Casey talked about the screens Dellavedova set for Bucks star Giannis Antetokounmpo in Game 1. The Toronto Raptors hope the NBA is paying attention to Matthew Dellavedova. On the eve of Game 2 in their best-of-seven opening-round series with Milwaukee, Raptors coach Dwane Casey talked about the screens Dellavedova set for Bucks star Giannis Antetokounmpo in Game 1. "He did set 18 screens and we did look at them," Casey said after practice Monday. "A lot of them weren't legal. "Now we've got to make sure we counter that and make the officials make a decision. The officials were saying that we're not hitting [the screens] or running into them. We've got to make sure we have a confrontation, because he's one of the great screen-setters in the league, just like John Stockton was. "There's no disrespect by saying that. It's a respect factor for Dellavedova that he does set hellacious screens." The Bucks upset Toronto 97-83 on Saturday night. Now, the Raptors look to even up the series Tuesday before it shifts to Milwaukee. Dellavedova, a 26-year-old guard from Australia, was also a burr in the Raptors' collective backside in last season's playoffs, setting screens for LeBron James in Cleveland's 4-2 series victory over Toronto in the Eastern Conference final. "You look at [the screens] in slow time, and believe me, they're moving, they're grabbing, they're holding ... He has set a precedent with it and they're not calling it," Casey reiterated. "We've got to make sure we set screens the same way, and now we show the officials those videos. "It's a credit to him that he sets screens that way and gets away with it." DeMar DeRozan laughed when asked about the legality of Dellavedova's screens. "If you pay my fine, I'll answer that question. Will you?" DeRozan asked. "I probably can't," the reporter answered. "OK, so next question," said DeRozan. 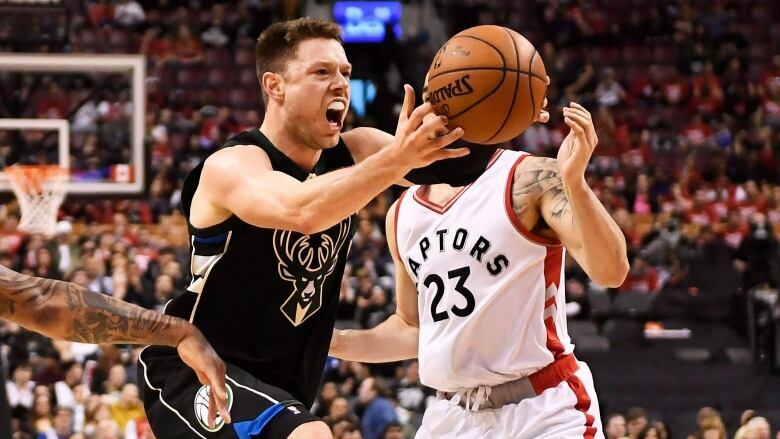 The Bucks practised in Milwaukee on Monday and Dellavedova was asked about Toronto's issue with his screens. "I think in the playoffs, my game is suited to that," he told the Milwaukee Journal Sentinel. "Where there's a lot on the line, it's going to be even more physical. "If you want to win, you've got to put your body on the line." Dellavedova compared the NBA to the more-physical international game. "The way they set screens, if you go under a screen internationally, the big man is going to roll you down in to the paint, so you really can't go under any screens," he told the Journal Sentinel. "Often times when I go back and play with Australians in the summertime, it's a lot more physical."